Founded in 1911, the American Psychoanalytic Association (APsaA) is the oldest national psychoanalytic organization in the nation. APsaA as a professional organization for psychoanalysts, focuses on education, research and membership development. APsaA has developed vibrant and innovative programming for the mental health profession and the general public. These programs provide forums for the exchange of new ideas and highlight the contribution of psychoanalytic principles in helping to understand important social problems. 24 Sessions as individual MP3 Audio files available as download or on free USB stick (playable on any computer, tablet, or other electronic listening device) USB stick delivered via Priority US Mail. 15% shipping and handling fees will be applied upon checkout. Writing for the public via a blog is one way to build a more active practice, grow a vibrant profession and contribute to society's understanding of human behavior and psychoanalytic ideas. Learn how you can contribute to APsaA's official blog - "Psychoanalysis: Unplugged" hosted on the Psychology Today webstie. This year’s session focuses on meeting the needs of Service Members, Veterans and their families across a broad range of clinical disciplines, systems of care and community settings. After attending this session, participants should be able to: 1) Describe the key components of Dynamic Interpersonal Therapy and Panic Focused Psychodynamic Psychotherapy; 2) Discuss psychotherapy process variables that are associated with positive outcomes in manualized psychodynamic psychotherapy approaches. After attending this session, participants should be able to: 1) Discuss the complex and layered legacy of the case of the Wolf-Man; 2) Explain why the place of this case in the contemporary psychoanalytic curriculum is the subject of current debate. World-renowned psychiatrist, psychoanalyst, author, and editor, Dr. Glen Gabbard, is the 2018 recipient of the Candidates’ Council Master-Teacher Award. Clinical Professor of Psychiatry at Baylor College of Medicine in Houston and Training and Supervising Analyst at the Center for Psychoanalytic Studies in Houston, he has authored or edited twenty-eight books, and held an unparalleled number of psychiatric and psychoanalytic leadership positions. He will discuss “The Difficult Patient” as recipient of this award, which is the only candidate driven award in APsaA to recognize Master-Teachers for their pivotal role in inspiring careers in psychoanalysis. Speakers: Otto F. Kernberg, M.D., Ellen Rees, M.D., Andrew J. Gerber, M.D., Ph.D. The organizers of the session take the position that a more robust emphasis on critical thinking and research will not only improve psychoanalytic education, but will also contribute to an improved standing of psychoanalysis as a discipline in the larger society. After attending this session, participants should be able to: 1) Describe the results of a randomized noninferiority trial comparing dynamic psychotherapy to cognitive therapy in the treatment of major depressive disorder in a community mental health setting; 2) Discuss the differential mechanisms of change across psychotherapies and the patient moderators of treatment effectiveness in the noninferiority trial. Speakers: Presenter: Lee Jaffe, Ph.D., President-Elect, Discussants: John Clarkin, Ph.D., Marianne Leuzinger-Bohleber, Ph.D.
After attending this session, participants should be able to: 1) Describe six elements of “talking cures,” which were culled from the life works of Sigmund Freud, and are basic ingredients to all forms of verbal psychotherapy and psychoanalysis; 2) Discuss the conceptual process necessary to develop a program of research to evaluate clinical and theoretical psychoanalytic propositions. 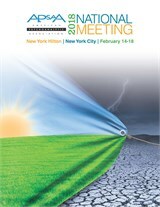 Speakers: Theodore Fallon, Jr., M.D., M.P.H., Robert Galatzer-Levy, M.D., Robert D. Stolorow, Ph.D., Ph.D. This symposium will consider Negative Capability in the light of new scientific paradigms such as non-linear dynamic systems and chaos theory, and new clinical perspectives such as mutually influencing interactions between analysts and analysands. After listening to this session, participants should be able to: Assess how APsaA can become a trusted advisor to the White House, agencies, and Congress on key issues by advocating for or against regulation or legislation that directly impacts APsaA members and the patients they serve; Describe how Congress, the agencies, and Administration have been functioning under the new Administration and the most effective ways to influence their decision making. After listening to this session, participants should be able to: 1) Discuss the major contributions of Andre Green to contemporary psychoanalytic theory and practice; 2) Apply Green’s contributions and theory to the analytic treatment of borderline and other non-neurotic patients moving beyond the techniques of classical analysis of neurotics. After listening to this session, participants should be able to: 1) Discuss the value of maintaining a steady frame in analysis and, conversely, the value that may be placed upon shifting the frame more freely; 2) Describe the unconscious fantasies that may emerge for both patient and analyst when the frame becomes the focus of analytic work. Speakers: Chair: Harriet L. Wolfe, M.D., President (San Francisco, CA) Introducer: James P. Frosch, M.D. (Cambridge, MA) Speaker: Steven H. Cooper, Ph.D.
“Playing in the Darkness: Use of the Object and Use of the Subject” After attending this session, participants should be able to: 1) Discuss the use of play in translating unrepresented experience; 2) Describe their countertransference resistance in translating unrepresented experience. An informal conversation with Dr. Busch, who has taught in Universities and psychoanalytic institutes for 40 years, presented at innumerable meetings at the local, national, and international level, published over 80 papers and three books, and presented over 150 papers and clinical workshops in many countries. Participants should be able to discuss panic focused psychodynamic psychotherapy and have an understanding of its principles and applications and discuss the building blocks of scientifically credible psychotherapy outcome research, particularly as regards psychoanalytic psychotherapy. Psychoanalysis in the Community Symposium: Does Immigration Stress or Strengthen Structure? How? Whose? Why? Presenters will include students and teachers from two of our nation’s most successful school reform networks, NYC Outward Bound and Expeditionary Learning. Such schools emphasize project-based learning, community-engaged curriculum, advisory systems, and restorative justice. In addition to academic achievement, signs of successes include: secure attachment relationships, the Eriksonian adolescent virtues of competence and fidelity, and non-violence. After listening to this session, participants should be able to describe the role of the Von Hemholtz School of Physiology on the development of Freud’s psychological theories, assess the neuroscientist Karl Friston’s updating and refining of the Helmholtzian principles of Freudian metapsychology, which combined with the role of affect in the brain, and explain how and why consciousness occurs. Participants should be able to: 1) Discuss how the evolutionary biology of REM sleep illuminates essential aspects of dreaming; 2) Discuss how to restore the centrality of the wish as the generator of dreams and all mental activity. Speakers: Volney P. Gay, Ph.D. , Kirkland C. Vaughans, Ph.D.
After attending this session, participants should be able to: 1) List several psychological mechanisms that can enable and encourage the acceptance and practice slavery by “ordinary” people; 2) Describe the gratifications offered by slavery and their historical denial. Listeners should be able to: 1) Use clinical expertise to better understand and engage with issues related to the Anthropocene; 2) Critique the often impenetrable border psychoanalysts erect that separates the human from the non-human environment. After listening to this session, participants should be able to: 1) Analyze the value of reconstruction in contemporary psychoanalysis; 2) Discuss emerging evidence about emotion-memory interactions and their relevance to the process of change.